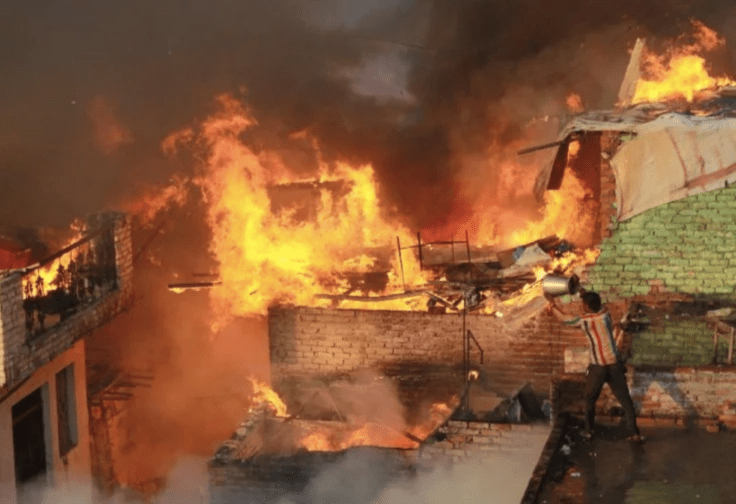 A Bharatiya Janata Party (BJP) minority cell member, has been named as an accused by the Special Investigation Team (SIT) probing the violence that led to the burning down of Muslim houses in Meerut’s Bhusa Mandi slum on March 6. BJP member Shahid Bharti is the third out of the total 30 identified among 80 suspects shortlisted by the SIT after analyzing three videos and eight photographs of the incident. The police, as per a News18 report, believe that the incident was a planned one and that Bharti was the mastermind. Bharti is reported to be a resident of Bhusa Mandi, and the area even has BJP posters featuring him. However, the ruling party quickly tried to distance itself from the controversy, stating that Bharti has not been in the party for a long time. “Earlier, he was a member of the party’s cell but he has not been with us for a long time. We have directed our cadre to remove posters and are also going for a verification of our existing office-bearers of the minority cell in Meerut,” The Indian Express quoted, Tehseen Ali, district chief of the cell as saying. But hours after Bharti’s name appeared as an accused, a letter nominating him as the minority cell member and signed by Ali on July 18, 2018, was found raising speculations over the party’s involvement in the case. Over 200 Muslim houses were burnt down in Bhusa Mandi, when the local authorities were trying to remove alleged encroachments from the area. While the police alleged that angry residents pelted stones at them, and even set the houses on fire, residents have squarely blamed the police for burning down their houses, and even assaulting them.